By Dan Henderson: In the past few days a lot of people have been asking me about a potential showdown between boxings two biggest stars Floyd Mayweather Jr and Manny Pacquiao. I’ve been asked all sorts of questions and the three that were asked the most was Is FMJ scared to fight Pacquiao?, Do think you think Pacquiao is on some form of PEDs and Who do you think would win?. Now I will give my answers. 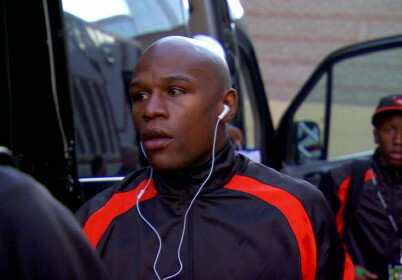 Is Floyd Mayweather Jr scared of Manny Pacquiao? This statement has made it into all forms of boxing sites and forums and I completely disagree I feel Floyd is not scared of Pacquiao. I can see why people would think that as we all know Floyd wants to keep his unbeaten record intact and if he were to lose that would damage his legacy in many peoples eyes whereas if Pacquiao was to lose it would not matter to much as when he won his light middleweight title to become boxings first and only eight weight champion his legacy was secured. Do I think Manny Pacquiao is on some form of PEDs? My answer to that is no. The reason I say this is because at some point in his career he would of been tested especially after his rise through the weight divisions. People argue about how much he weighed when he began his career but when he was 17 he weighed in at roughly 106lbs and when FMJ won his first Golden Gloves tournament at the age of 16 that was at 106lbs so they have both gone from the same sort of weight to both now being in the Welterweight division. This is the hardest question in sport today and I honestly couldn’t choose but put on the spot I would favour FMJ because of his defence and counter punching ability but in saying that Pacquiao has got the power to hurt Floyd and he puts combinations together with ease. So it is a hard one to call what I do know is that it would make for an interesting fight if it ever happens. There is no way we can say for sure who would win but we are entitled to our opinions so aslong as the fight doesn’t happen then the questions will remain answered by opinions only we will get all the answers to the questions if and when they face each other. « Khan will fight Kell Brook but only if he leaves Matchroom Sport: Is this just an excuse?